McArthur has devoted fifteen years to photographing animals living in painful circumstances. 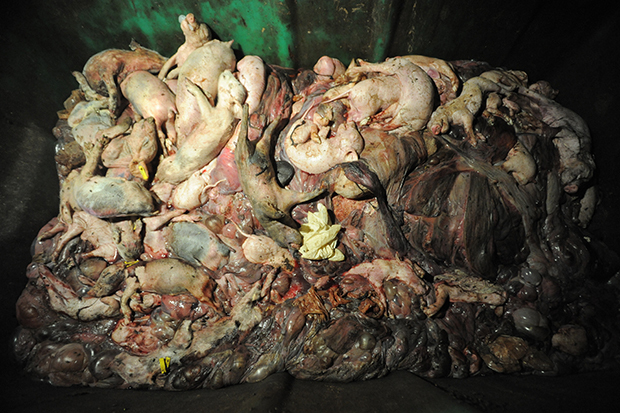 These are the animals we don’t see, who live inside farms, labs, and cages all over the world. 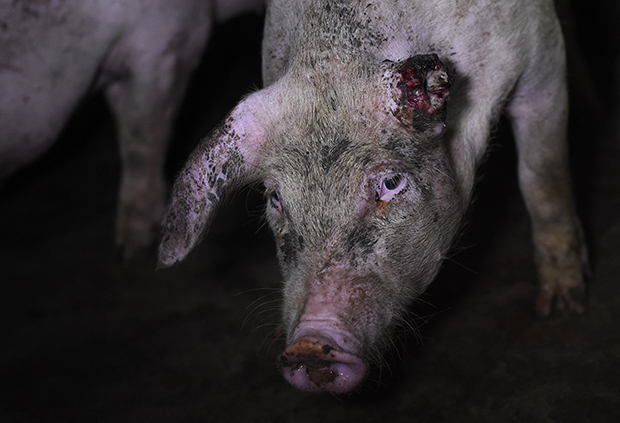 When she meets a pig in a factory farm, McArthur allows him or her to sniff her hand. She bends down to pig eye level so as not to frighten the animal. There’s a female pig in McArthur’s first book We Animals, photographed in Spain in 2009, and this particular pig has followed the photojournalist throughout the years. She is photographed at the top of this story. “Pigs are insatiably curious,” McArthur tells me. 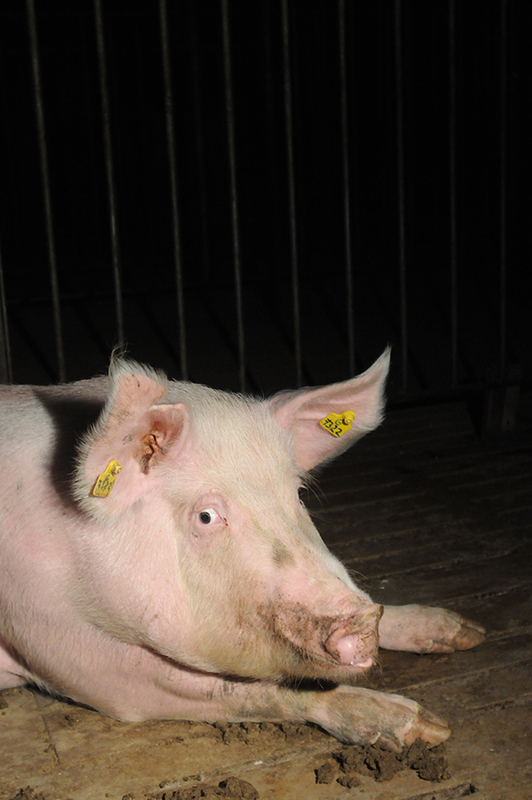 Pigs are emotional, social, and intelligent creatures, and in factory farms, the photographer says the mental deprivation can be as acute as the physical harm. 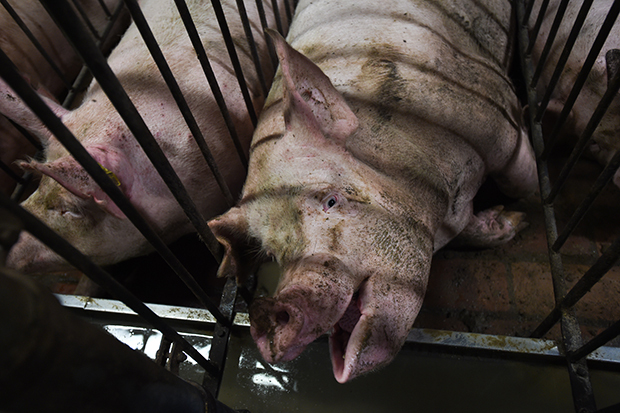 That Spanish pig in We Animals was most likely used for breeding. 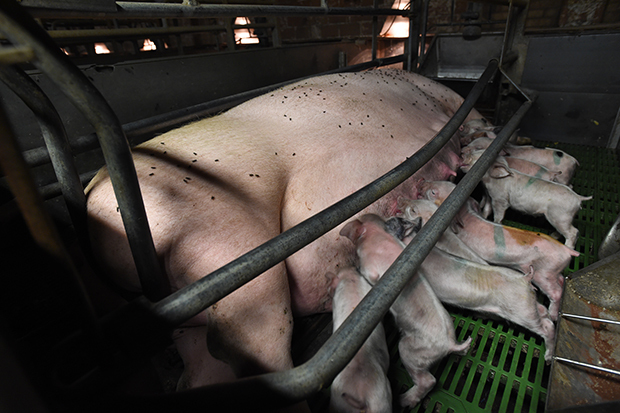 A “breeder pig” is artificially inseminated twice or three times each year. 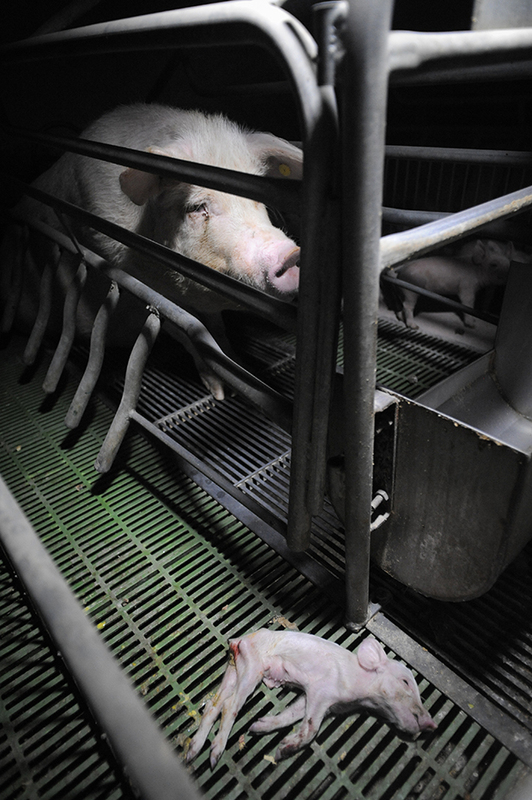 When she gives birth to her piglets, she is unable to interact with them. 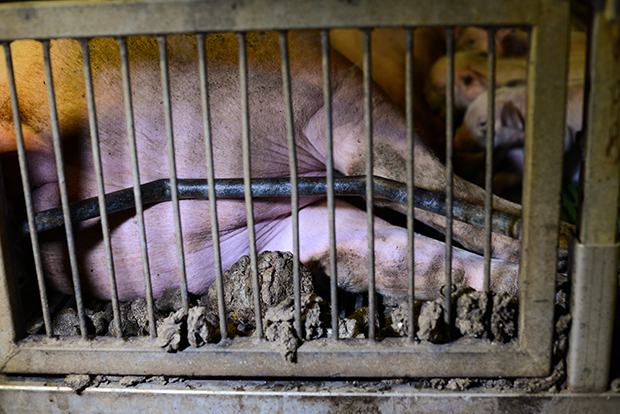 She’s kept behind bars in a crate, where she cannot turn around and has trouble lying down. The pig in the book didn’t have a name, or if she did, McArthur never knew it. 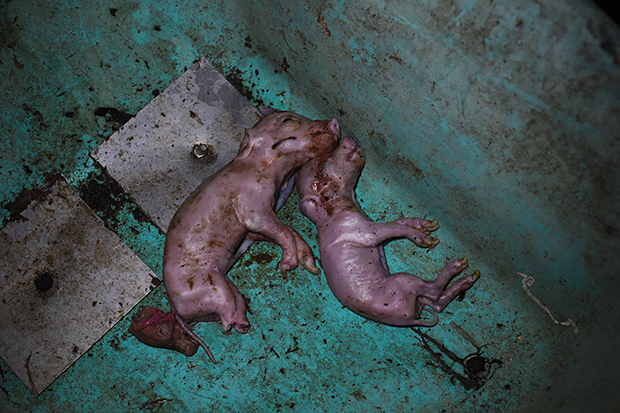 The title of that image is “The Pig I Hope Is Dead.” This title can be applied to countless animals in the same situation, including the piglets who grow up to live the same life their mothers did. 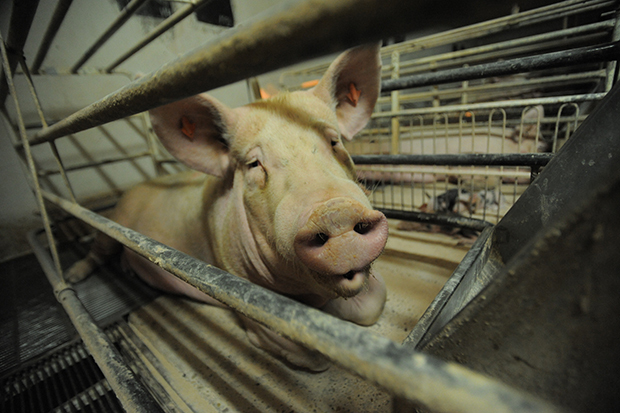 It’s common for the pigs to develop respiratory problems due to the ammonia inside the farms. “I wish death for them, knowing that that will likely be the only release they have from pain,” the photojournalist explains. McArthur’s rule of not touching anything means, of course, that she’s unable to save the pigs. Walking out through that door is the most painful part of the work she does, and it’s the one that takes the highest emotional toll. And in seeing these images, the hope is we will be capable of recognizing reflections of our own humanity. As a result, perhaps we can reduce the amount of meat and animal products we consume. A pig’s curiosity, even in desperate circumstances, leads the animal to make eye contact with people as they pass. 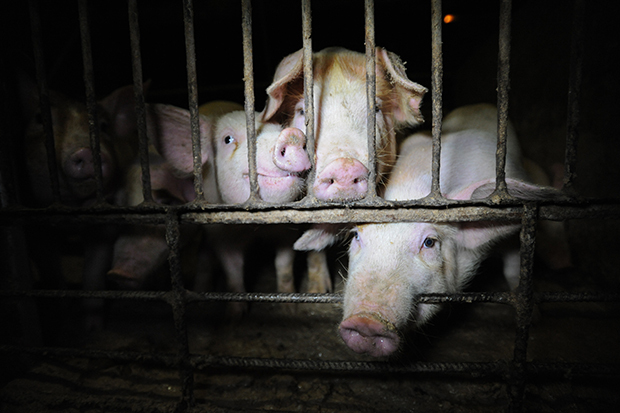 In these pictures as in life, the pigs search against all hope for an impossible escape. 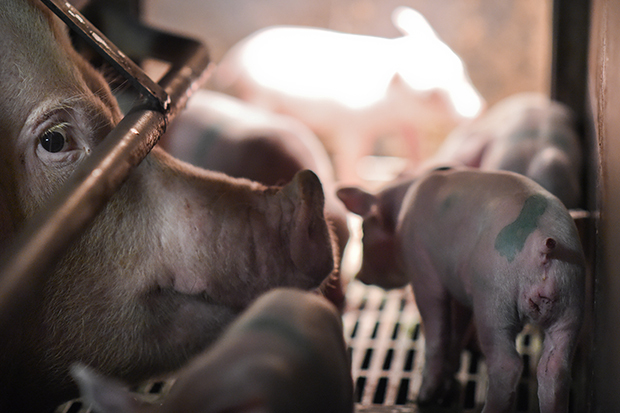 These pigs, whether they’re living or dead, deserve at least to be seen. This post is the first in a series of seven stories we will be publishing about photojournalist Jo-Anne McArthur and the We Animals Archive. Hundreds of pictures from the We Animals Archive are available for free to charitable and educational organizations. The project relies on donations from the public. Make a one-time donation here, and if you’re interested in contributing monthly, you can do so here. Find the book We Animals here, and find McArthur’s new book, Captive, here.